One would refuse to call him a monk, seeing him dressed in modern attire but the ever composed face will capture your attention. A smile, that makes even a stranger confide in him and words, that are of a monk. One will easily know how he carries such beautiful caliber when he/she reads “The monk who sold his Ferrari”. 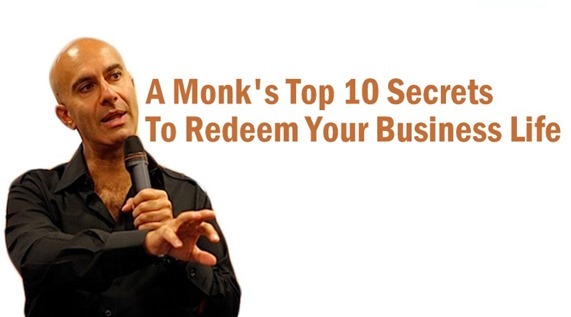 And yes we’re talking about the monk in disguise – ROBIN SHARMA. Most of his books have been bestsellers and he’s the most sought after business advisor to many Fortune 500 companies. Out of his many immortal books, one should truly get their hands on “The Greatness Guide”. The overwhelming success of this book even led to the writing of the sequel book “Greatness Guide 2”. In Greatness Guide, Robin beautifully accounts various incidents in his life that teach us different ways to master personal and business life. So I must say, this book is a must read for everybody of different walks of life and especially to the special community that is a think tank of new ideas and possibilities, most often called “the entrepreneurs”. Even if you’re day is planned by minute, you should squeeze in just 30 minutes of your day. Rest assured, the book will be done in 3days! There are many things Robin throws light on that we comfortably are blind to while going about a typical business day. So let’s refocus on the bare minimum things we did to get where we are today and have no clue where to go and how to go about it. Getting started, all of us are aware of the questions that almost eat you up when you even start to think of innovating/a new idea, forget starting to execute the idea. Each day life will send you little windows of opportunity. Your destiny will be defined by how you respond to these windows of opportunity. Shrink from them and your life will be small. Feel the fear and run to them anyway and your life will be big. When even your spouse can’t reach you on the phone and when your days are made up of travel and exotic meals-you know you’re in the locality called Success. As they say never let success get to your head and failure to your heart. But it’s incredibly tough when you can’t handle the success. Success actually breeds complacency, inefficiency and – worst of all – Arrogance. When people and businesses get really successful, they often fall in love with themselves. They stop innovating, working hard, taking risks and begin to rest on their laurels. The more successful you and your organization become, the more humble and devoted to your customers you need to be. Now that we’ve talked about success it’s inevitable to ignore painful setbacks or simply put failures. When you’re in the phase of “going gets tough”, no wise words can ease the pain, but you will reconsider if it’s from the monk right? Just when you’ve tried everything and ready to give up, rethink your decision. Winners always go that extra mile for what they wish to see happen. Just so you know, the traffic on the extra mile is always less. Ordinary people don’t spend much time on the extra mile. But who ever said you were ordinary? Didn’t know there could be many fonts until Job’s Mackintosh! There are entrepreneurs like Jobs and there are those who can’t make it big with their products. Genius is not about being born like one, it’s about becoming one. But for those ones who think otherwise, this is what Robin has to say. Jobs once said, “Deciding what not to do is as important as deciding what to do”. For an entrepreneur, making a choice decides his/her destiny. To bag a huge account, you might be tempted to say yes when it’s actually a no. So learn to say no. Every time you say yes to something that is unimportant, you say no to something that is important. Pressure and Stress have always plagued us and no one wants to be stressed. But pressure and stress do you good if you learn Robin’s way. Amidst working hard, making choices there’s one element that makes you even more productive- it’s called “Having fun!” Before you mock at it, read what Robin has to say! The U.S. software firm Veritas saw something amazing happen after it introduced “email – free Fridays”: Friday became the most productive and creative day of the week. Newton didn’t come up with his breakthrough observations on the laws of physics while rushing to catch a subway. Creativity comes when you are relaxed, happy and enjoying the moment. Customers and clients are the demigods of our business. It’s not about treating them the way you want to, it’s about treating them the way they’d like to be treated. The handle on my carry–on luggage broke after my tour of Russia, I took the piece in to Evex, the handle was fixed. Perfect. While in New York a little later, the handle broke again. I assumed that I’d have to pay for the repair. Most business put clients through so many hurdles: If you haven’t saved the receipt you are out of luck. Well, Evex is different. They just get it. They fixed it. “And of course, sir, there will be no charge.”, said the woman at the counter. Real leadership is not about prestige. Power or status. It is about responsibility. 10. Last but not the least, being an entrepreneur should not deter you from learning. The only way new things come to life is by learning about how to do it, or how others did it. If you eat three times a day you’ll be fed. But if you read three times a day you’ll be wise. Too many people never pick up a book after they’ve finished school. Too many people spend more time watching TV than getting deep inside the minds of the greatest people who have walked the planet. Never leave home without a book in your hand.